After landing in Sydney from Melbourne I took the Qantas shuttle straight over to international. I had carry on only with a plan to buy a new case in Thailand to bring back any extras I might buy overseas. It was about 8.10am as I arrived and the economy queue was relatively long. Fortunately there was nobody in the First Class queue although the check-in girl was dealing with someone as I arrived. Whilst standing in the queue a Thai representative came and confirmed I was in first class and asked my name. A moment later I was checked in and had my boarding pass and express departures card in hand. I filled in my outbound passenger card and headed toward the express path area which was basically deserted, so I was straight through security and passport control and headed into the shopping area. I had a quick look at jackets (after leaving mine at home! ), but decided it was all overpriced and I would have a look at Bangkok during my overnight visit. 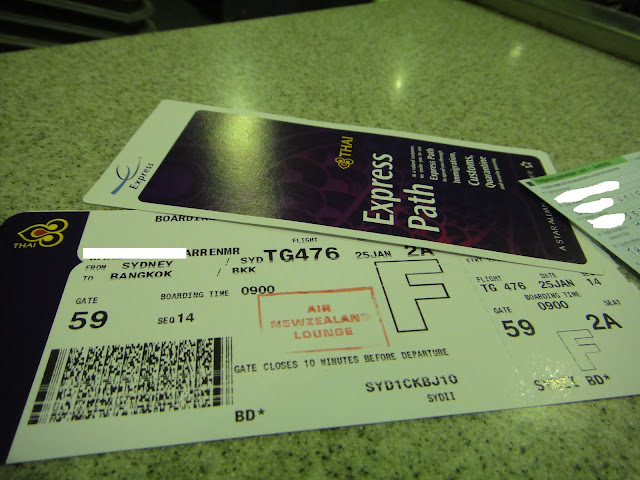 I headed for the Air New Zealand lounge, skipping the option of the Singapore First lounge. I made my way into the lounge and as I was looking for my boarding pass in my bag I suddenly realised I had left my Samsonite passport wallet at the check-in desk. I spoke to the lounge agent who made a phone call to check-in who confirmed that they had found it and would deliver it to the gate area. Phew! The lounge was quite busy with various NZ and star alliance departures. There was a great view of my aircraft HS-TGX, a 14 year old 747 delivered new to Thai in 1997. I was pleased to see TGX parked at the gate as I knew it was one of the aircraft with the more modern first class seating and in the week before my flight Thai had been sending old configuration birds to Sydney on a regular basis! Much to the disgust of business class passengers who went from angled lie flats to recliners. But this was not the case today! Not wanting to miss any of the champagne I headed down to the gate area early and picked up my passport wallet which was waiting for me. A minute later boarding was called for First and Business class. I made my way straight down the airbridge and was warmly greeted and escorted to my seat, 2A. It only took a matter of seconds before I was offered a hot towel and choice of welcome beverage. I asked for and was given, the Dom Perignon 2002. In fact all 4 first class passengers were drinking it as the welcome drink and we finished one bottle between us before takeoff, with me taking the last few drops! I declined opening another bottle before takeoff and told them to pop it after takeoff instead! Menu's were provided and the rimowa amenity kit and noise cancelling headphones were waiting at each seat. Purple coloured pyjamas and slippers were also handed out before takeoff, with one passenger immediately heading to the lavatory and getting changed. I personally prefer to wait until we are in the air to remove shoes or change clothes, in case there is an emergency (highly unlikely I know) and we have to evacuate. I think I would feel rather silly standing on the tarmac in my purple pyjamas and slippers! At 5 minutes past 10 am, with all passengers on board the doors were closed and we pushed back. The safety video was played and I made myself comfortable.... looking forward to the next 9 hours of first class travel. Mr Tug Driver - thanks! We made our way to runway 34L and were soon powering down the runway and into the grey skies. The loud noise of the nose wheel retracting is very noticeable on the 747 in the nose section. I quite like it myself, check the YouTube video to hear it. Once we were airborne I popped the lid for the entertainment unit and watched our progress on the map. I flipped through the entertainment guide and settled on watching the movie 'Contagion' (which was pretty ordinary by the way). The seatbelt sign was switched off once we were above the cloud layers and I decided to check out the lavatory. It featured Bvlgari fragrance and Aigner moisturiser. Anything else you might need is in the amenity kit. The crew were quickly up and preparing the first class bar area in the centre of the cabin. here they had a selection of soft drinks and wines along with glasses and ice. You could help yourself at anytime which was quite handy. Once the bar was set up I was quickly offered drinks and warmed nuts. I selected the Dom Perignon along with Perrier sparkling mineral water. I was offered additional warm nuts once I had almost finished the first lot. Very quickly the canapes arrived and the crew got out the very large table for me. If you have a friend on board they can sit on the ottoman and dine together with you if you wish. I was again offered a hot towel which was left on the table on a silver tray for use during the meal I assume. Next up was the caviar service and the crew came around with a trolley containing the caviar, garnitures and frozen smirnoff vodka. I decided to go for the whole lot. Once I was done with my caviar it was time for the appetiser. The table was set with a bowl of salad and my own bread basket. I was offered a choice of salad dressing between thousand island or balsamic, I took the balsamic. My appetiser was also presented and it looked quite appealing to me. One upon a time I wouldnt eat much seafood but as I have aged I've really started appreciating prawns and scallops. So this went down very well indeed. There was a side sauce which went very well with it too. Next up was my main course, the Beef Fillet with Madeira sauce. The main meal was quite tasty and I finished it all off. Whilst I was eating the crew were very attentive with the wines and I tried one of the white wines which was quite good. I also tried the Veuve Rose which was fine, but I soon switched back to my favourite, the Dom Perignon. I'm not sure how many bottles they loaded but it didn't run out at all thankfully. I was already getting full by this stage but I wasn't going to miss out on anything so when the fruit and cheese tray came out I took a sample of the lot! I slowly picked away at my fruit and cheese whilst i continued to watch my movie. Once I was done the crew came around and offered dessert. It was an apple and berry crumble with vanilla sauce. To go with that I asked for a cappuccino. I was also given a ferrero rocher chocolate! After all that food and wine I was almost ready to burst but I was very pleased! The crew soon turned out the lights so people could sleep if they wished. After a meal like that and very little sleep the night before I passed out for about 3 hours or so on the very comfortable bed. It's a pity only a thin economy class style blanket was on offer though. After sleeping and watching tv it was time for the second meal service. This started about 90 minutes before arrival in Bangkok. Once again, my table was set and I opted for Dom Perignon and Perrier. By this stage I discovered they had Downton Abbey on the inflight entertainment system, it's one of my favourite shows. I watched episodes 1 and 2 before arrival in Bangkok. What could be better than sitting back drinking Dom in first class and watching Downton??? It's hard to beat! The captain announced our descent and weather for arrival in Bangkok as 'partly cloudy skies with temperature 32 degrees celsius'. During the descent we entered a holding pattern due to traffic congestion in Bangkok and we remained in the hold for about 15 or 20 minutes before continuing on to make a landing on runway 19R. We made our way to gate C1 and disembarked. Thai Airways ground staff were waiting with signs displaying the names of the first class passengers. I made my way to my staff member and was soon on the buggy and speeding through the airport to express immigration. Once through immigration the ground staff asked if I needed any help with luggage, hotels or transport. I needed no help with any of them so I made my way landside and headed for a taxi into town. Overall a great flight with very attentive staff and nice food. Definitely a Royal First Class experience and I was looking forward to the following day's flight to Tokyo. Great video yet again! Please keep them coming and as many as possible. Keep up the great work mate. * I laughed out loud at your comment "Fortunately there was nobody in the First Class queue"
* I laughed out loud again at your anxiety about purple pyjamas and slippers in the "highly unlikely event of an emergency"
* We are kindred spirits in most other aspects ESPECIALLY champagne and overeating because, well, it's there and it looks fab! you asked for "the lot", maybe thai interpretation was "a lot"
very enjoy your blog here. Can I ask one question? was the airNZ lounge better than Singapore Air lounge in Sydney?